Akita Dog Welcome Sign. Our Akita Welcome Sign features a hand painted resin dog reproduction based on an original carving of your favorite dog breed - the Akita. The Akital Dog in Gait 2 dimensional figure is mounted on a solid oak sign - the dog measures approximately 11 1/2" in length depending on breed and the wooden sign measures 4 1/2" x 15". 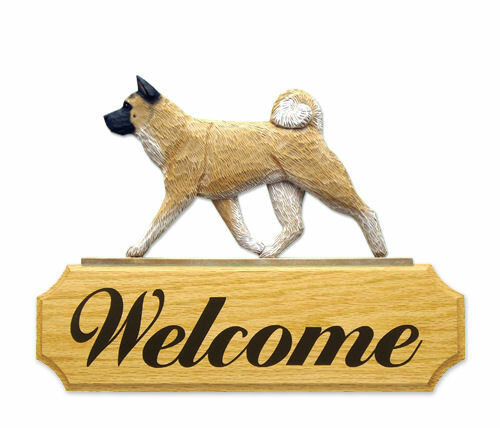 ThisAkital Welcome Sign is the perfect entry decor for the dog lover home! Made in USA. Dimensions:Bar the dog is mounted on is 11 1/2" in length - dog height and width varies depending on breed Sign measures 4 1/2" x 15"